iDisk is arguably the most useful .Mac feature of all. Who wouldn’t want personal storage in the clouds or, in reality, on Apple’s secure servers (that is, big powerful computers)? For one thing, data copied to your iDisk is safe and preserved if anyone should ever drop a bowling ball on your computer. What’s more, as long as you have an online connection, you can access the files in your iDisk locker wherever you happen to be, even from a Windows machine. Plus, you can easily collaborate or exchange documents with others or access files remotely yourself, especially those too large to email. Basic .Mac membership comes with 1GB (gigabyte) of storage space, which you can allocate as you want between iDisk and your .Mac email account. You can boost the storage amount to 2GB or 4GB for a fee. Upgrade prices are prorated daily; your .Mac expiration date is unchanged. Subscribers to .Mac can access iDisk via the Finder by choosing Go –> iDisk –> My iDisk (or by pressing Shift+Command+I). The icon for iDisk also shows up in all Finder windows. You can connect to another user’s iDisk or Public folder in the same manner. Click that icon now. If you didn’t know better, you’d think iDisk was like any other hard drive inside or connected to your computer. 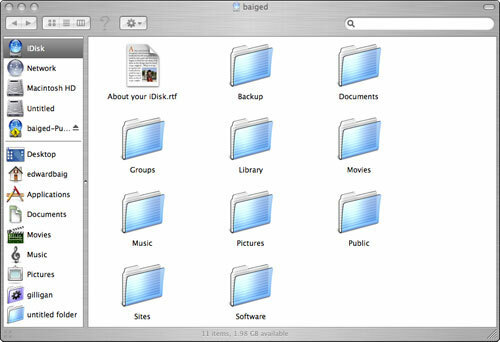 An iDisk consists of 10 folders (or 11 for a Family Pack account) for storing your digital valuables. Storing files in these folders is as simple as dragging stuff to them, just as with any Mac folder. Most of the folders shown in Figure 1, including Documents, Movies, Music, and Pictures, are self-explanatory. Figure 1: iDisk is organized into folders. Public: You can share the contents of this folder with anybody in cyberspace who knows your .Mac name and (if you created one) password. Sites: Holds the Web pages you spawned through a .Mac feature called HomePage. Groups: Here’s where to put files for the Little League team, the book club, or the clandestine committee planning to overthrow your company’s management. .Mac Groups members can share calendars, photos, files, and so on, and post to group message boards. They also get ad-free email. The iDisk Groups folder has subfolders that are accessible only to group members. Shared: This folder appears only if you have a Family Pack .Mac membership. Included are files that can be accessed by the master account holder and subaccounts. Backup: Houses the files you’ve backed up using a .Mac software feature called Backup. Software: Includes programs and files available only to .Mac members, plus other software that you can download from Apple. You can’t drag your own files to this folder. Library: Another read-only folder. It includes files for .Mac Sync, which lets you keep personal data (such as bookmarks, addresses, mailboxes, and calendars) synchronized among all the Macs you own, provided that they’re connected to the Net. If you ever decide not to renew a .Mac account, drag your data back onto your Mac’s own hard drive before the account expires.